I wanted to add a running page of self portraits. I find many posts giving excuses for the portraits not having much of a likeness or not capturing what the artist wanted to say.Like anything else, I think this takes time to develop. I have found it very amusing, from time to time, to spend some time with drawing and painting my portrait or parts of myself. We seldom realise we have a built-in model in ourselves, so the following will be added to as I create them. Who said we have to draw a portrait of our face? We can use all parts of ourselves. I did this contour study in ink in my second drawing class. 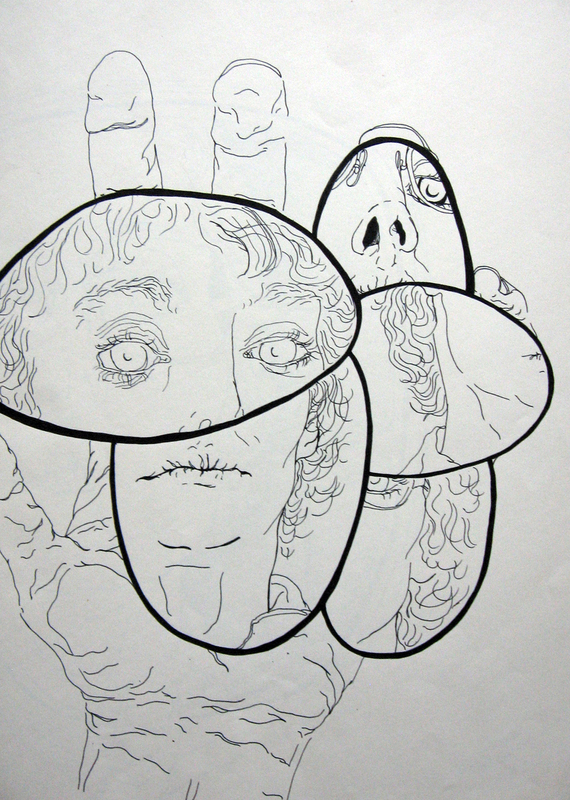 The above three were drawn for drawing classes in 1981. 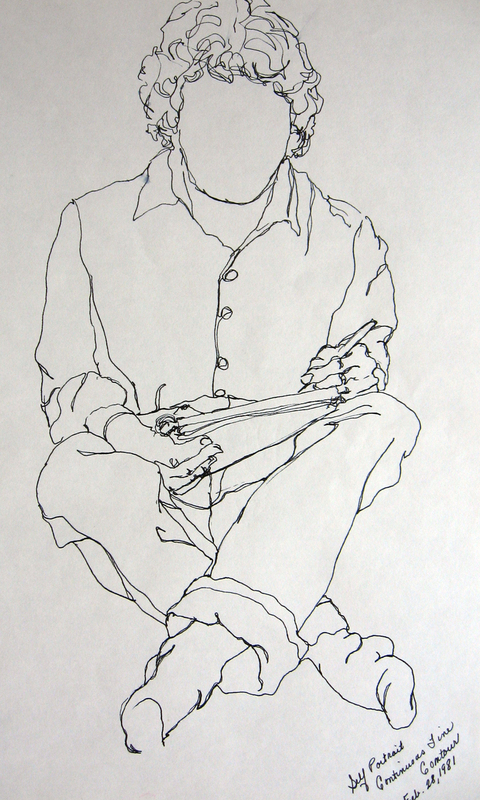 In the top two, the instructor had suggested that I concentrate on drawing figures without a face for a while. The bottom one was suggested as a creative assignment and the instructor suggested we somehow fragment parts of ourselves for our self portraiture. The above three self portraits are done in watercolor. 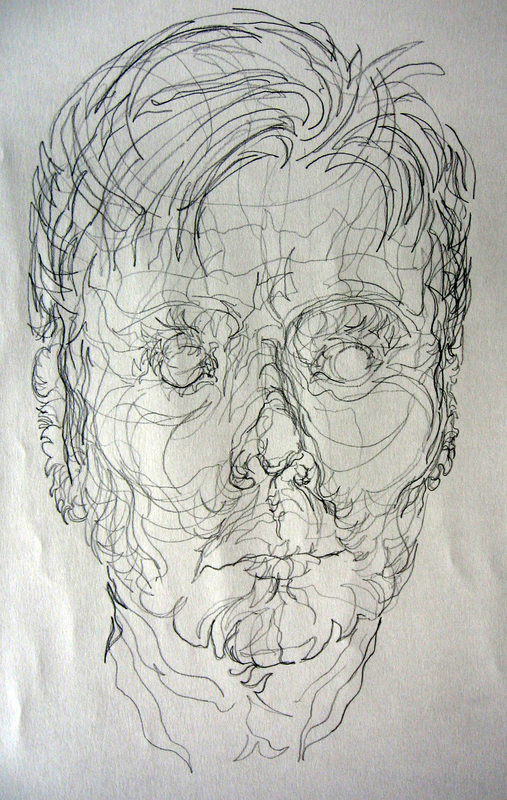 I did three because I was searching for one that I liked to enter in a local open show, here, titled “Self Portrait”. I chose the third one. I liked it the best. It is interesting to note, here that the top two were done from a photograph and the bottom one was drawn and painted from a reverse image in a mirror. 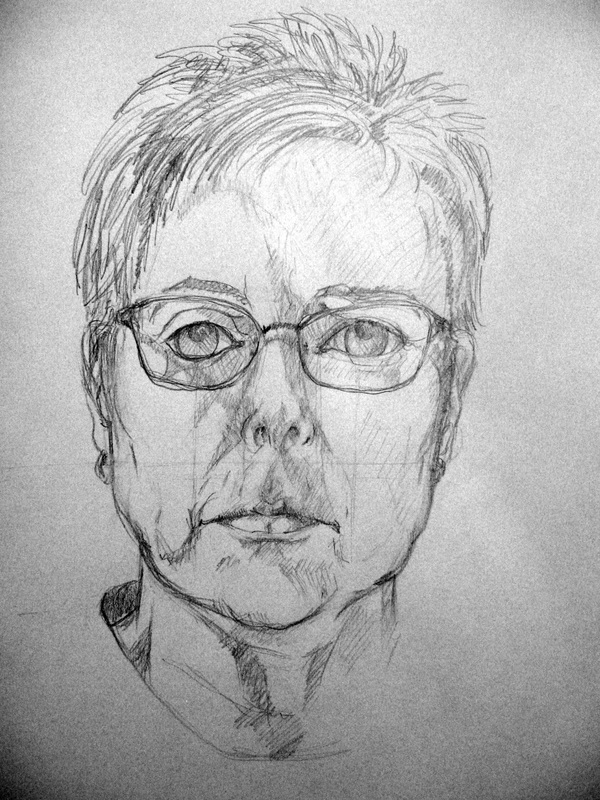 I started this self portrait in a drawing class from a mirror image drawn in graphite. Over a few days time, I kept sitting down in front of the mirror and adding color, first watercolor and then colored pencil. This would be considered a mixed media. 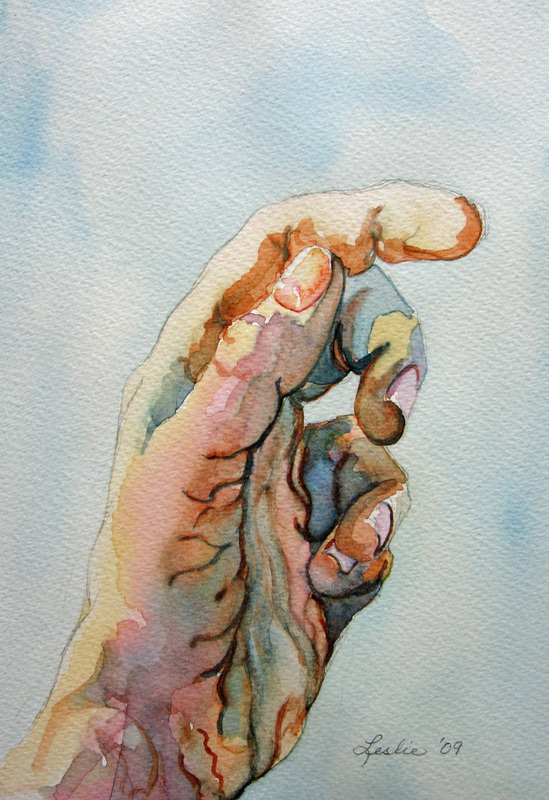 My left hand and self portrait in watercolor. Hands from life and portrait was mirror image. 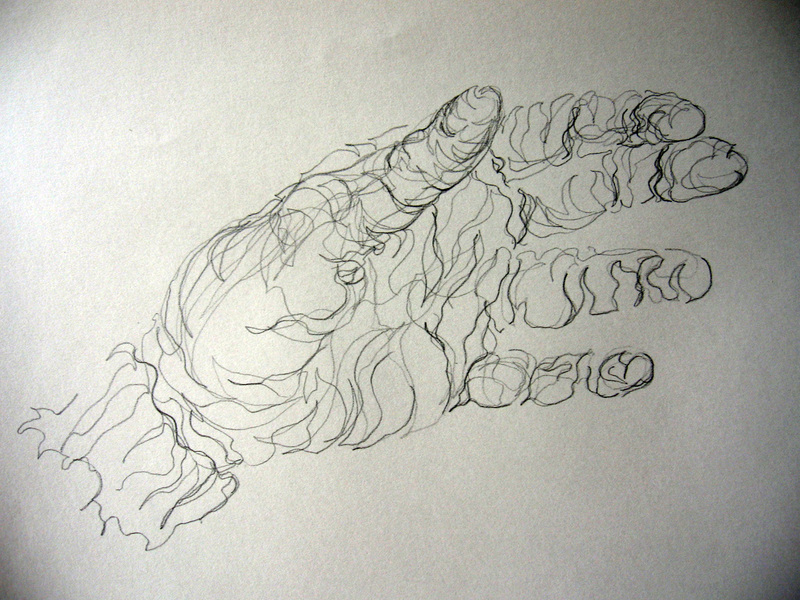 Graphite hand and self portrait using cross contour line. Hand from life and portrait from mirror image. 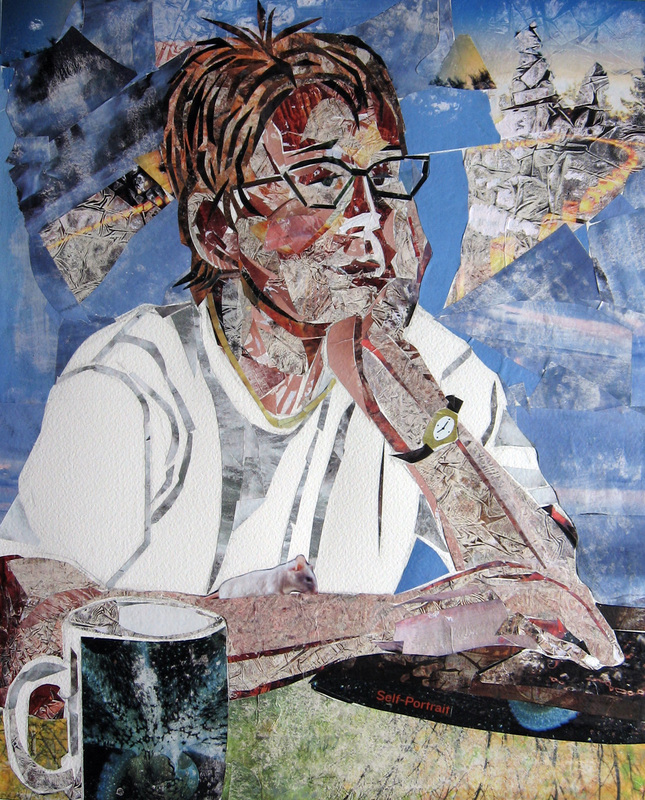 This self portrait was created using papers made from treating National Geographic photos with Citra-Solv. A description of the process can be found here. 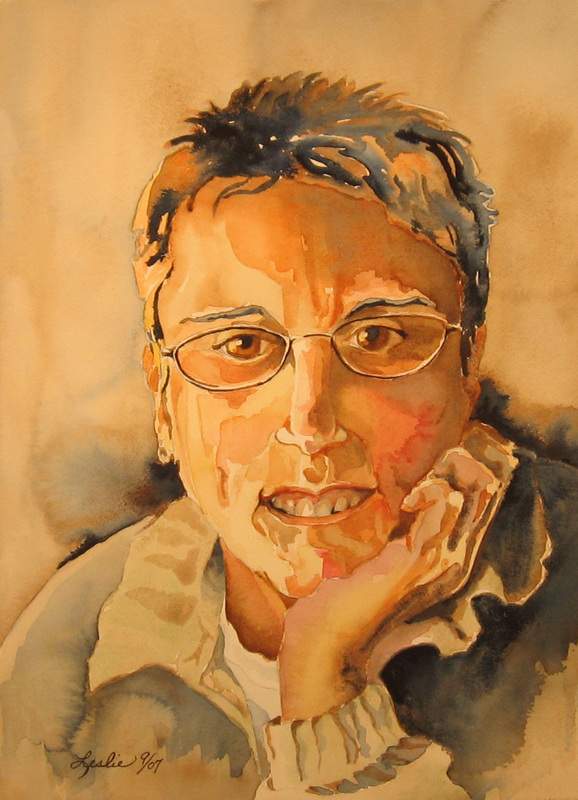 The above portrait was painted on masa paper with watercolor. A description of this process can be found here. This is a wonderful page. I love seeing how you see yourself. Those 2009 hands are stunning! The colours! Also, it’s interesting how much more life there is in the mirror than in a photo. Thank-you, Kirsty. Such a nice comment. 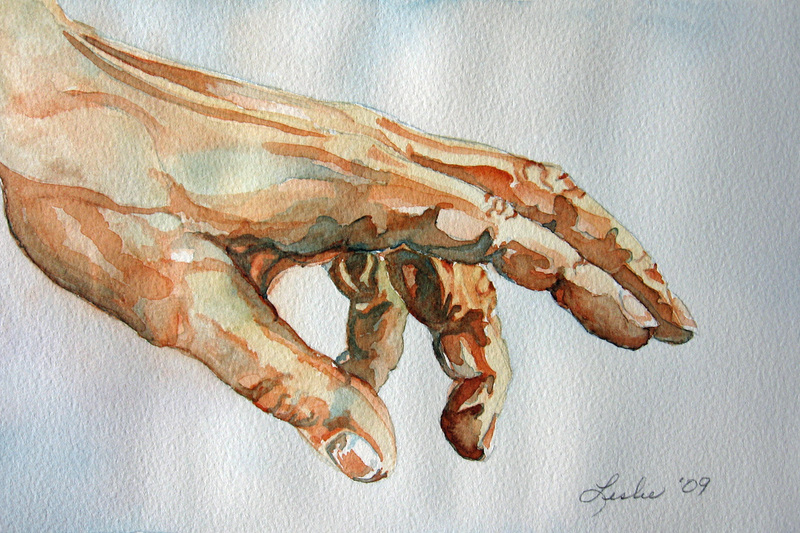 In the hand paintings, I was using a different kind of watercolor paper for each one, also. I agree with you about the mirror image paintings and drawings. There is definitely more life to them. awesome works, I’ve just told you so in my previous comment. What a great collection of portraits! Great hand drawings too,I like your use of colors, especially the way you choose colors for the shade areas. 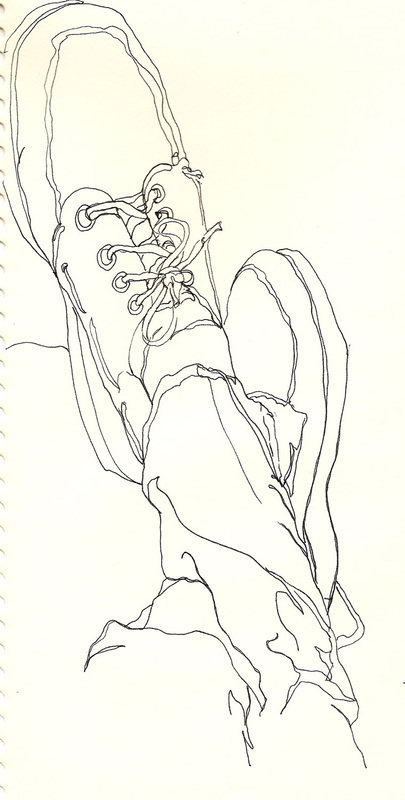 The cross contour line drawings are amazing! Thank-you, so much, Sandrine. Cross contours come out so different looking. I like to practice them in hopes that I include more evidence of them in my other work. Leslie, this is a wonderful idea to post them all in one place, this really helps to introspect on your portraiture. I think I can recognize you in your pic, even if you did not mention your name along with it, in other words, I think you have been successful 🙂 It must have been really tough to do it from a mirror image, isnt it? Thank-you so much, Padmaja. Mirror images are just drawing or painting from you reflection in the mirror. If you sit and just paint from one mirror, you get the reverse image of yourself. If you set another mirror behind you, you can reflect the real image of yourself back into the mirror and get the correct image of yourself. I have not done that, so really what you are looking at in my mirror image is the reverse of me as I saw me when I rendered it. The hard part, for me, is wrestling with that old complex that wants to say it’s not good enough. I finally had to come to terms with myself and tell me that I am rarely satisfied with my landscapes, still lifes, animal portraits, etc. Sort of like saying to myself, “why do you expect any better from your self portrait?”. Perhaps it is a little of that word vain showing thru, here. I purchased a book, not long ago, in a paperback that was jam packed with famous artists self portraits and was so impressed with their images and creativity that it made practicing my own image a little more easy. This is something I have to look at as being fun as well as a study to perfecting my skills.That has carried me into enjoying it. Great question!!!!! This page is great Leslie! I love to see how our faces change (and also our perception of them). My favorites are the ones done in 2007 so far. I have this fascinating book…. 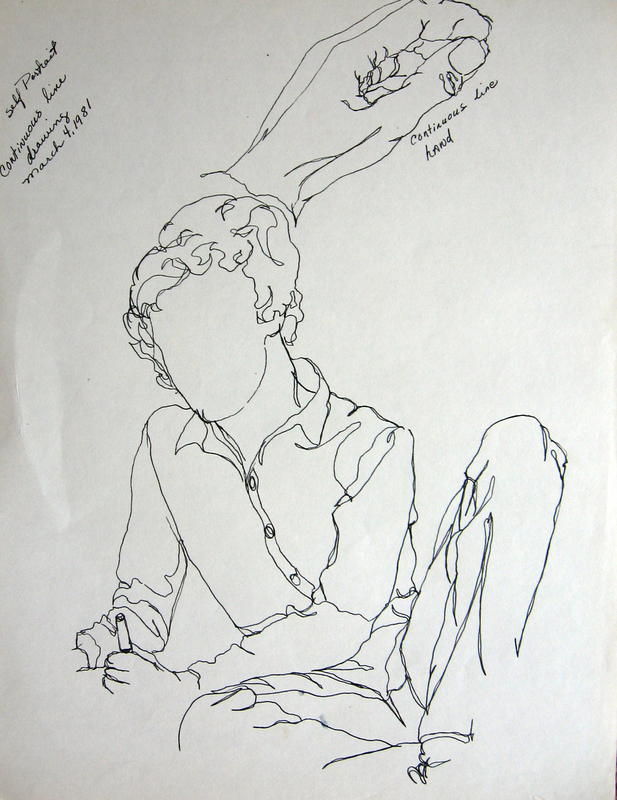 You’ve given me an idea Leslie – I am going to feature some artist’s self portraits on my blog in the future. Thanks! Thank-you, Lynda! I think that is a great idea! I have that book and spoke of it in one of my replies either on this page or the post. Thank-you for including the link. I have sat and paged through that book so much that the pages are coming loose and the binding has broken on my copy. I am fascinated by the creativity of some of them. what i like most about this page is that it shows how you have grown as an artist over the years. I think it’s in the nature of students to be impatient. lol. It certainly does show over time. Unfortunately with my work it’s inconsistent. Wow, these are great, Leslie!! I love them all! Wonderful page! I am so glad you decided to post it! A great timeline and expression diary for yourself, a great learning tool for the rest of us. Thank you so much! Thanks, Alex! You inspired the courage in me to post these, you know. 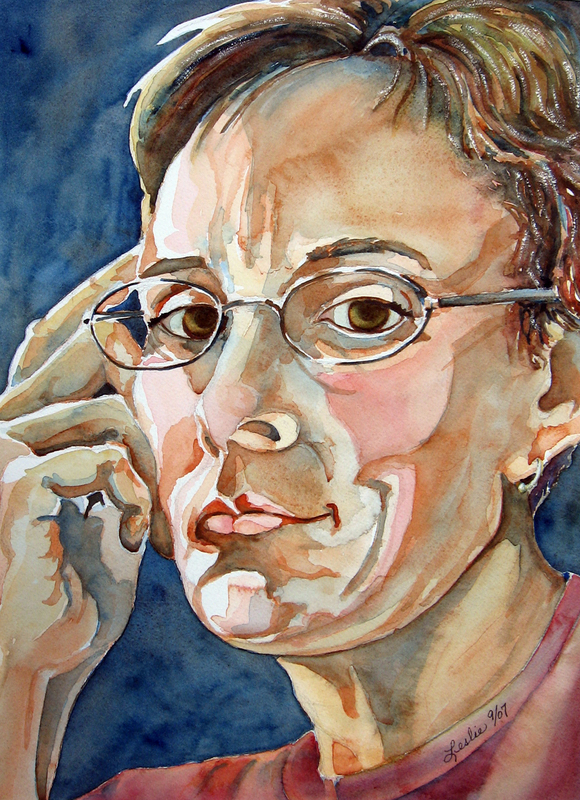 I hope you add a self portrait page to your blog! 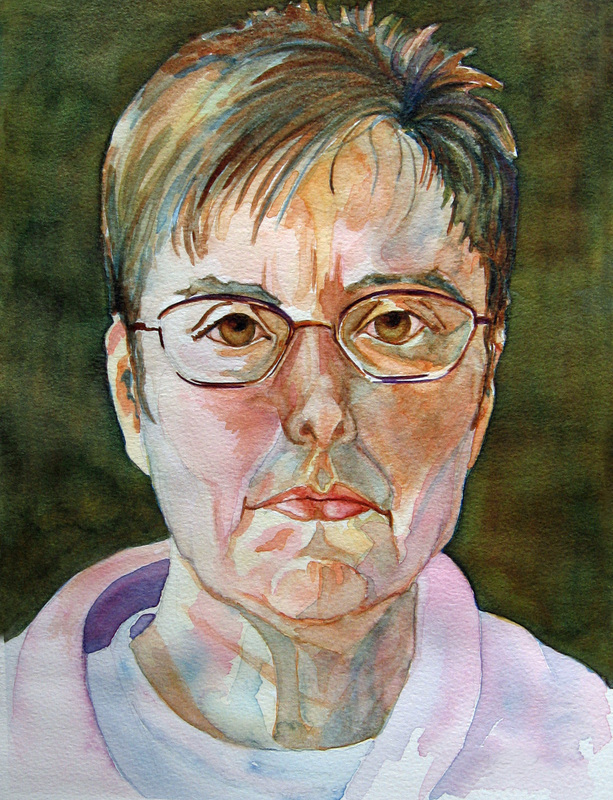 People rarely recognise themselves in self-portraits, I think. Ditto people who hear themselves for the first time on tape (or whatever had taken over from tape, my how that dates me!) Our perceptions of ourselves are often far different – and much more critical – than how others perceive us. 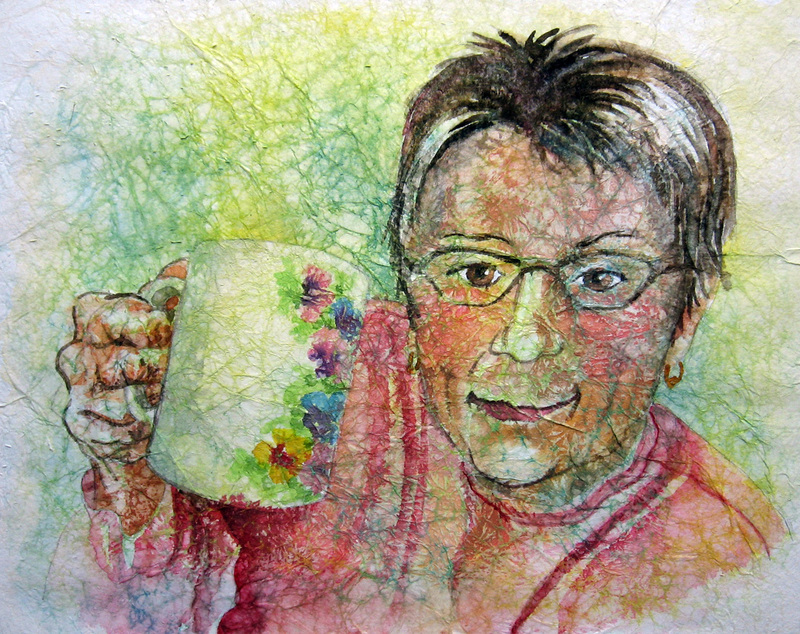 I like the softest of your self-portraits, I think it is the mixed media one. The others are good, but I like the softer quality of that one. And I love the hands and the feet! 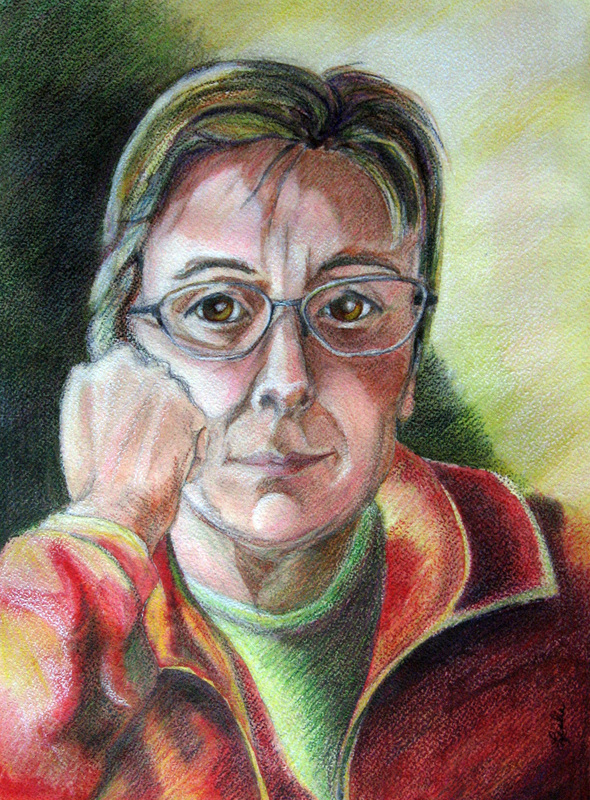 I’ve only done one self-portait and that was from a photo. I find that if I use a mirror, my concentration wanders too much. Also, of course, as I’ve written somewhere in my blog, I find it difficult to actually recognise myself, particularly in a mirror. When working from a photo, I’ve had time to let the image be more fixed in my mind as being ‘me’. I’ve got a lot of cartoons of myself, done from imagination. I wonder if these also fall into the ‘self-portrait’ definition? How about you trying that? I’d love to see some! Everything on this page is a source of inspiration to me. 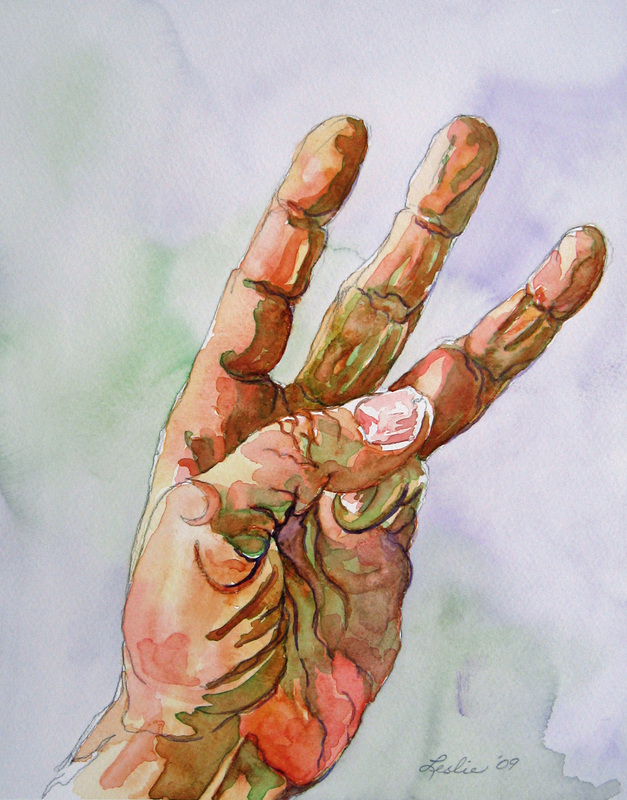 Your hands are three dimensional and I’m studying the line and wash work in great detail. I simply love your SP, they’re all beautiful. You’ve also been so kind in sending many visitors to my humble blog. I really appreciate our exchanges. Wow, I just loved seeing all your self portraits. I think they are all fabulous and inspiring. What an artist! I admire you for overcoming all that it took to post this fabulous work. Thanks for coming through. 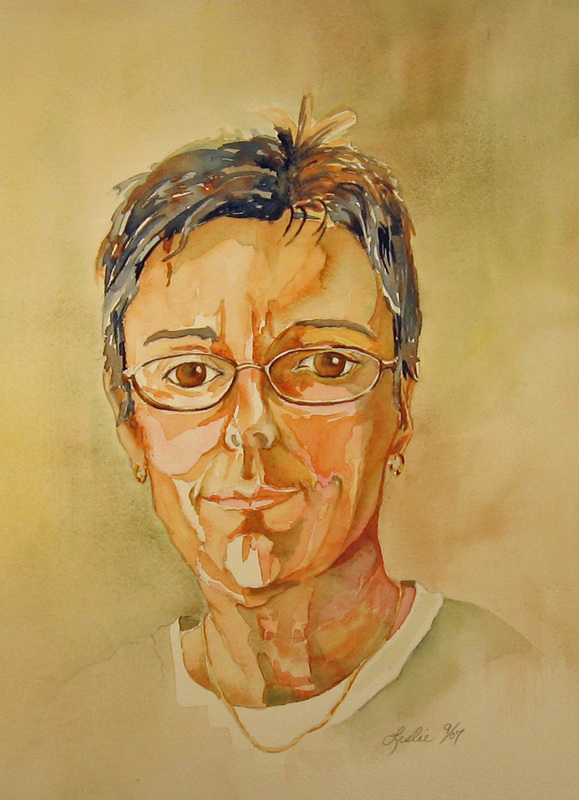 I have a question – probably a silly one – when you do your own portrait, does the portrait look the way you think you look? Do those close to you consider these as good likenesses? Or does any of that matter? I love these questions! I think the portrait looks the way I think I look. There is one, above, that I don’t think looks like me. It says 2007 and is the one where two hands are holding a white handkerchief. I must have been in “la-la land”. My children NEVER think they look like me and tell me I always paint myself looking too old. My Granddaughter knows they are me every single time! She wins big awards from her Grandma for that. There is one other thing, Souldipper. The ones that are mirror image means I’m staring at myself in a mirror. They all have that artist stare that happens when we look at ourselves overly long. Chuckle. Have you ever had to write who you are for a teacher in a creative writing class? Phew! I have tried. I never quite think I’ve described who I am. Doing these is probably like that. I never am quite satisfied. I will continue to do them. They are fun and I can learn so much about seeing and it’s just good practice. I really need to find a full length mirror in a garage sale next summer and really have some fun! Thank-you, Souldipper!!! What a fascinating look at yourself! I like this and admire your ability. Great page Leslie. Like your 2010 collage. Thank you! These are just plain fun to do once I get going on them. I need to do some more of that citra-solv collaging. They are time consuming but very enjoyable to sit and work on. If I had it together, I could start one and just work on it in between paintings and take my time with it. I think that one is my favorite, also. wonderful work, the various forms, colors, techniques. like it. thanks for sharing. That’s what everybody says. I don’t know how much of me I’ve caught in these. My Grandchildren know who it is when they look at them but my children say they don’t look like me. Go figure. 🙂 Thankyou, Andro. These are really interesting – to see both how you have changed and developed over the years. Self-portraits are hard to do…I should try one. Thank You! I like doing them, now. I think, since there is a collection of them, I feel like I’m just showing another view of me to add to the whole. The first few times I drew myself was the hardest. I learn something new with each one. Really interesting page Leslie, keep going. I can’t pick a favourite as they are all special. Too early in 2015 for a new one? Oh, I must! I must! I would really like to take some time and do a collage one again, for sure. I also enjoyed the tri-color one. Thank you, Outsideauthority! Looking at all these wonderful portraits.just inspires me.am drawing my first self portrait from a mirror,with graphite pencils,its for my art portfolio am creating to submit to an art college i’ll be applying to.i have been on it for weeks and drawing my left eye has been super challenging.my major fear is the drawing not looking like me. If you are working from a mirror you will always draw the eyes looking right back at you. That is because we are always to draw what we see. A mirror image is also the reverse image of ourselves. We will also draw ourselves looking at us if we are using a reference photo where we were looking at the person taking the photo. 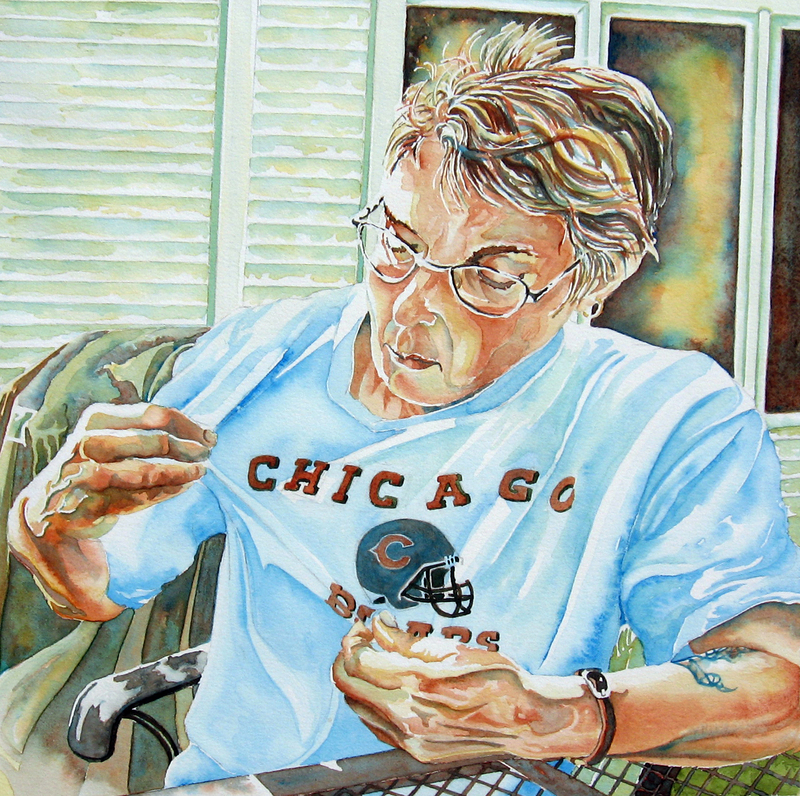 Self portraits, painted from a mirror seem to have a different stare. I call it the “self portrait stare”. I love it! Most of the time I can tell if my students have drawn themselves from a mirror image or from a photo reference just because of that. 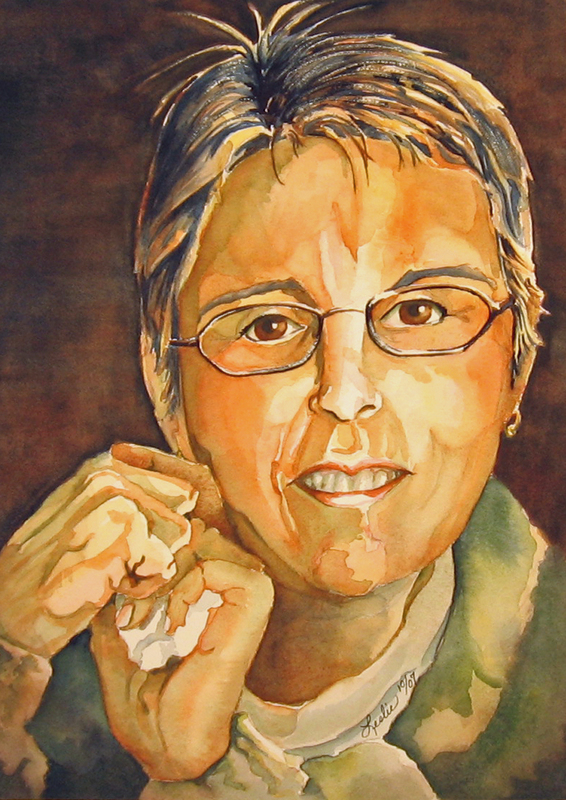 Good luck on the completion of your portrait, and thank you for letting me know that Mine inspired you. High praise, indeed! Do not worry if your portrait does not look like you. It will be the body of work that matters. 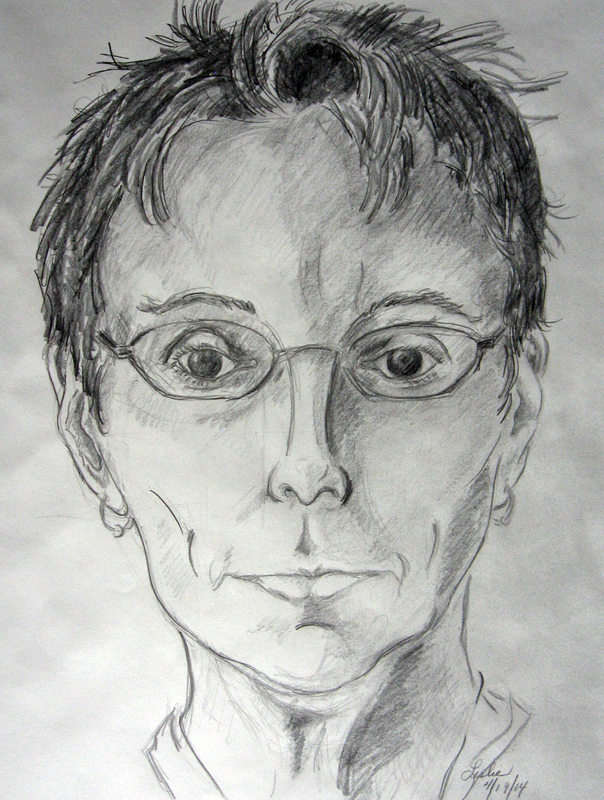 We grow …that first self portrait begins the journey and it is all uphill from there! 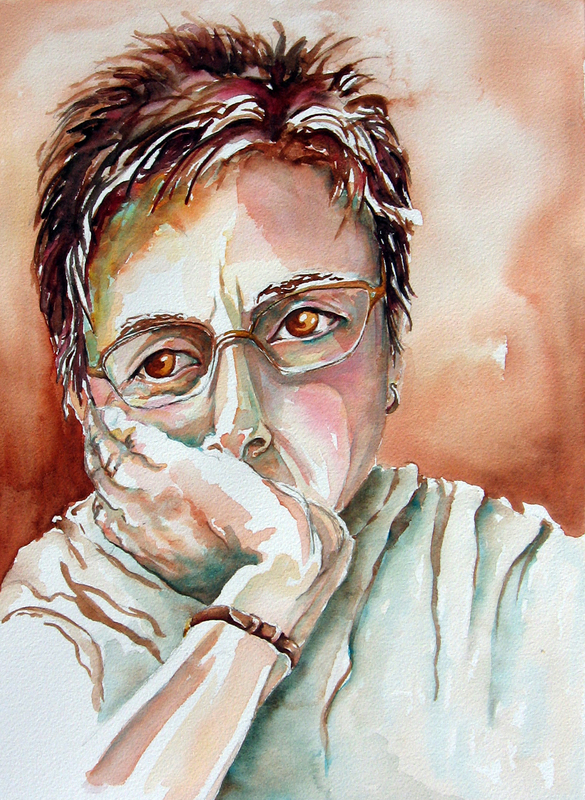 I found your blog when I was searching for watercolor portraits. The third one from 2007 is awesome. The use of different tones for skin and for light makes it so warm, so real. I also loved the one from 2014 and the one with your dog.